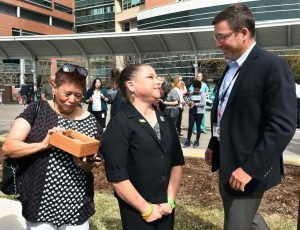 Sara Millard didn't know the name of the person who gave her a life-saving organ after 17 years of waiting. She dubbed it her #MysteryKidney. Now the mystery has been solved. 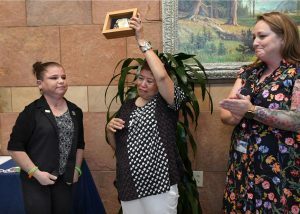 Sara Millard, left, presents her world championship belt buckle to Ruth Sena, the mother of her kidney transplant donor, Leticia Marie Sena. Photo by Kathryn Scott for UCHealth. Sara Millard gave away her most prized possession. And, in return, she has received a priceless gift: life. Sara received a kidney transplant on March 17, 2017. For nearly two years, she didn’t know who gave her the organ. She dubbed it her #MysteryKidney. Sara Millard wearing her world championship belt buckle during a training session with her blind horse, Tazz.. Photo by Mark Reis for UCHealth. She knew her donor must have been someone special because Sara felt infused with a new sense of optimism and dedication to help others. Now 33, Sara was born critically ill and has endured 152 surgeries over her lifetime. (Click here to learn more about Millard’s health journey.) She had waited 17 years for the organ she needed. She’s far from alone. Across the U.S., more than 120,000 people are waiting for transplants. About 2,500 of them are in Colorado and Wyoming, and every year, about 8,000 people die in the U.S. while waiting for an organ donation. Leticia Maria Sena died far too young after an asthma attack. She was an organ donor. Sara Millard recently learned that her kidney came from Leticia. Photo courtesy of Ruth Sena. The kidney Sara received freed her from dialysis and allowed her to pursue her dreams. She’s in school now to become a hospital chaplain so she can give solace to others who are enduring health challenges. She’s a rodeo athlete too. She competes in an event called cart shooting and just three months after her transplant surgery, Sara clinched her fourth world championship. In rodeo, champions win intricate, engraved belt buckles instead of trophies. Sara treasured her world championship belt buckle and wore it proudly. 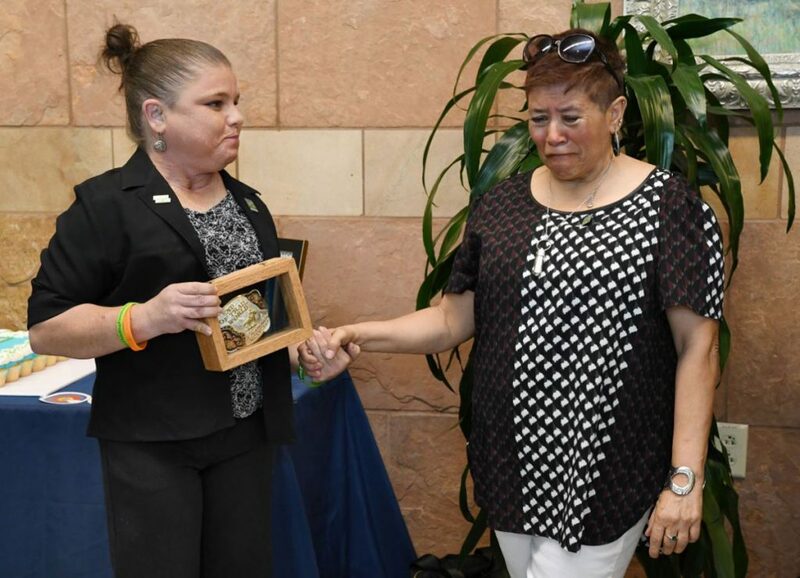 Sara Millard holds her belt buckle moments before she gave it away to honor her kidney donor, Leticia Marie Sena. Photo by Kathryn Scott for UCHealth. Then she hatched a plan to give it away. Sara recently learned the name of the woman who had blessed her with a second chance at life. Her #MysteryKidney is no longer a mystery. The kidney came from a young woman named Leticia Marie Sena. Leticia died when she was just 35 after a fatal asthma attack. She left behind two young daughters and a loving family. She passed away on March 16, 2017. The next day, because Leticia was an organ donor, she gave life to Sara. The gift came full circle this month. Ruth Sena holds up the belt buckle that Sara gave her to honor her daughter, Leticia Marie Sena. Photo by Kathryn Scott for UCHealth. Thanks to Donor Alliance, which served as a go-between, Sara exchanged letters with Leticia’s mom, Ruth Sena. Despite the pain of losing her only child, Ruth decided to open her heart to a relationship with Sara. The two eventually met and have become close. 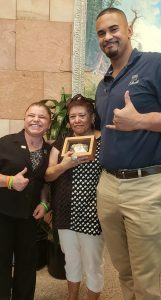 To honor Leticia during National Donate Life Month, Sara recently gave Ruth her championship belt buckle. 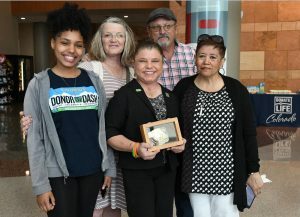 “This buckle has meant so much to me,” Millard said during a flag-raising event to celebrate organ donations at UCHealth University of Colorado Hospital on the Anschutz Medical Campus. “This is now in Leticia’s name, Leticia Marie Sena, aka #MysteryKidney,” Millard said of her championship. She had placed the shiny buckle in a handcrafted shadow box. Nevaeh Sena, Leticia’s daughter, poses with Sara, Ruth and Sara’s parents. Photo by Kathryn Scott for UCHealth. “The box was made by my Uncle, David Douglas of Bennington, Kansas so you will always have a piece of our family with you,” Sara said. The moment was both terribly sad and joyous for Ruth. She wiped tears from her eyes, held the buckle up over her head and thanked Sara. Ruth Sena hugs Sara Millard after giving her a blanket she made for her. Sara received a kidney transplant because Ruth’s daughter was an organ donor. Photo by Kathryn Scott for UCHealth. Later, Ruth said how much it had meant to her to meet Sara and see that some good had come from the tragic loss of her daughter. “A part of Leticia is in Sara. That makes me feel so good,” Ruth said. One of Leticia’s daughters was also on hand for the ceremony. Nevaeh Sena is 14. She watched her mom suffer the fatal asthma attack and had to call for help. The gift of the buckle began with a simple letter. Sara wanted to let the family of her #MysteryKidney donor know what a difference their loved one had made for her. Months after Sara received her transplant, she wrote a letter to what was then an anonymous donor and sent it to Donor Alliance. “Dearest Donor Family, I am truly sorry for your loss, but I am so grateful, thankful and blessed to be continuing living,” Sara wrote. Ruth Sena made a blanket for Sara Millard, while Millard gave Sena her world championship belt buckle to honor Sena’s daughter, Leticia. Photo by Kathryn Osler for UCHealth. “Your gift has given me the chance to compete with my miniature horse, Tazz, and become a 4-time World Champion. I have been able to meet Olympic snowboarder and fellow transplant patient, Chris Klug. When I met him on July 17, 2017, he helped me honor your loved ones during our own inpatient Donor Dash. While running in the halls of the hospital, he asked me to join him as a Patient Ambassador for the Chris Klug Foundation. Their focus is on educating and registering people as organ, eye and tissue donors…. “I try to live each day knowing that you and your family have given me this day and this life. I can only hope to spread the joy and love that every single day holds to others,” Sara wrote. Sara was thrilled to receive a reply. “My name is Ruth. My daughter, Leticia, was your donor, and I wanted to tell you a little about her so that you will know how special she was,” Ruth wrote. Ruth Sena, left, admires the rodeo belt buckle that Sara Millard gave her to honor her donor, Leticia Marie Sena. Sara speaks with Dr. Trevor Nydam, who did the transplant surgery. Photo by Kathryn Scott for UCHealth. Ruth told Sara that Leticia had worked at a bank, then pursued her dream of becoming a beautician. “Coloring was her specialty, and she did wonders for her clients,” Ruth wrote. Sara wrote back quickly. A new relationship was born. Sara met Leticia’s family and friends. She and Ruth discovered interesting coincidences. 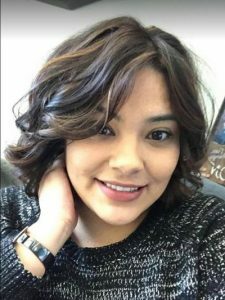 Both families have ties with Pueblo, where Sara lives now and where Ruth had raised Leticia before she moved to Aurora and Ruth followed to be closer to her granddaughters. The culmination of their relationship thus far came during the flag-raising ceremony. Sara Millard, left, Ruth Sena, middle, and former Denver Bronco, Ryan Harris. Photo courtesy of Sara Millard. Also on hand was Ryan Harris, a 10-year veteran of the NFL, who played for the Denver Broncos when they won Super Bowl 50 in 2016. Harris’ father also needed a kidney donation, so Ryan and his family are dedicated proponents of organ donation. Both Ruth and Sara are big sports fans and the two petite women (Sara is 4’ 7’’ and Ruth is 4’ 11’’) stood next to Harris (who is 6’ 5’’) for photos and to help raise the flag outside the hospital. Ruth was positively giddy after meeting Harris. 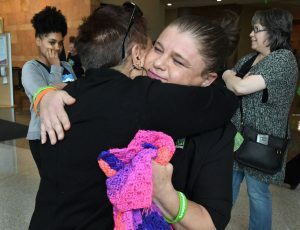 Being part of a celebration for organ donors was a “huge honor,” she said. Her only wish was that Leticia could have been there. “If you would have gotten Leticia and Sara together, you’d be laughing for days,” Ruth said. She plans to display Sara’s belt buckle prominently in the china cabinet in her home. 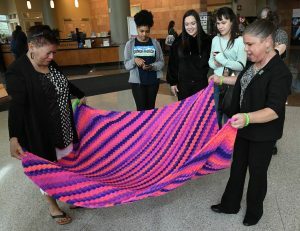 To honor Sara, Ruth spent weeks crocheting a special blanket for her. Purple is Sarah’s favorite color and Ruth added blue and orange to the blanket, the perfect colors to celebrate the Broncos too. Sara wrapped the blanket around her shoulders as Ruth held the belt buckle. Now, both families carry each other in their hearts.